Graduated from the Faculty of Economics, University of Belgrade. In his professional experience, he passed all the steps of a successful businessman, and today is the CEO of TRAYAL Corporation A.D. Krusevac. 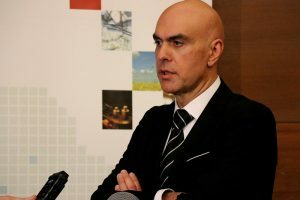 During his professional career, he was equally successful in social and sports activities such as: Chairman of the Board of Directors of the Italian – Serbian Business Council, Member of the Executive Board of the American – Serbian Business Forum, Member of the European Parliament of Enterprises, member of the Management Board of the Serbian Chamber of Commerce, President of the Assembly of the Serbian Chamber of Commerce, Member of the Management Board of the National Employment Service, member of the Social-Economic Council of the Republic of Serbia, member of the City Council of Krusevac in charge of the economy, Vice President and Deputy President of the Serbian Association of Employers, Member of the Management Board of the Basketball Club Partizan Belgrade, Vice President of the Board of the Basketball Club Napredak Krusevac, Vice President of the Football Club Napredak Krusevac and President of the Club’s Assembly, and other activities. 2004 Award “Manager of the Year”, by the Serbian Chamber of Commerce. Ivan Kovačević, ĐURO SALAJ A.D.